People often ask me how long it takes to weave a towel. The short answer is: I don’t know. I don’t weave one towel from start to finish and then weave the next one. 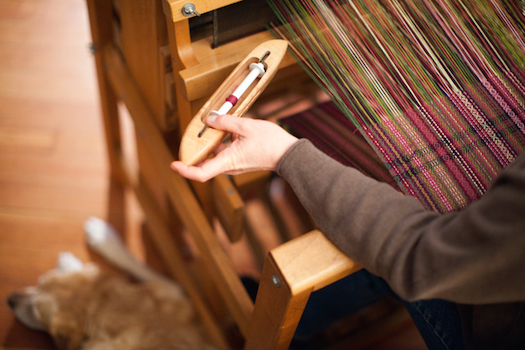 It takes a long time to set up the loom, so I make a warp as long as possible, which with my equipment is 11.75 yards. Once all the threads are on the loom, I weave a towel, place a marker to indicate the end of one towel and the beginning of the next, then weave the next towel. By the time I reach the end of the warp, I have 10-11 towels. Then I wash and dry the cloth, cut the towels apart and finally hem them. A couple of times, I’ve set out to answer this question more precisely. On one such day it took me six focused hours to warp and dress the loom. It was a straightforward design and I didn’t make any major mistakes that required searching for the trouble spots and then rethreading hundreds of threads. The following day I got caught up with weaving and forgot to pay attention to the clock. Even if I remember to track the time for the different steps, there are unknowns and grey areas. Do I count the time the woven cloth spends in the washer and dryer with the rest of my laundry while I cook dinner? What about the walk I took to clear my mind as I grappled with a design issue? If I put my feet up and watch Murdoch Mysteries while I hem, does that qualify as working? How do I calculate design time? I recently wove some towels that are olive, pistachio, pink and flax. Although the specific colors came together quickly in the moment, the idea of greens and pink had been percolating for years. After a couple aborted attempts to track the time spent on weaving a towel, I realized that I don’t want to know how long it takes. Weaving is a slow process. The slowness, the many repetitive steps suit me. My natural rhythm is slow. I would rather get up a half hour earlier in the morning than have to rush around. I think and process information slowly. I attribute some of this respect for slowness to a childhood in India. Life was slower in the 60’s and 70’s than it is now. It was even slower in India. Like most families, we didn’t have a telephone, so we wrote letters. I delivered notes to my teachers. People dropped by. We walked most places. On road trips with my family road conditions were such that Dad rarely drove more than 45-50 km/h (27-30 mph). Trains frequently ran late and made many stops. Engaging in a slow craft is also a choice. I have grown more efficient, and hence faster, over the years. I could make changes to speed up my process – like simplifying designs or sewing the hems with a machine. But I choose not to. I do not want to churn out towels as quickly as possible. We have machines that do that. Ultimately, it’s not about the time. It’s about rhythm. About the satisfaction of watching the cloth grow. About getting lost in my thoughts. Being surprised by new color combinations. Keeping the joy alive by figuring out how to make each piece different. Infusing the towels with love and time so that they add sacredness to those ordinary moments of drying your hands or setting the table. It’s about choosing a life. A “sip-by-sip life,” to borrow from the founders of the tea company, The Republic of Tea. A life where the small moments are savored. So how long does it take to weave a towel? Exactly the right amount of time. P.S. 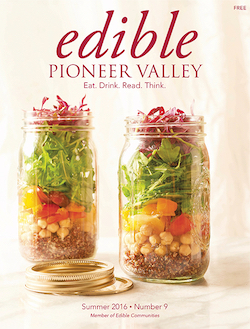 I’m delighted to have Whimsy & Tea napkins featured in the summer issue of Edible Pioneer Valley. Thank you to Andrew Lacasse for referring me, Mary Reilly for including me, Alice Lee for writing such a warm piece, and Dominic Perri for the lovely photograph. I love this post because it speaks so directly to my heart’s desire for connection. There is something about a product that has been made with love by human hands which nourishes my soul in a way that machine-made products cannot. I could buy towels similar in appearance to your’s at Target or Pottery Barn but those towels are mass-produced in China and Bangladesh. Even if they are hand finished, the energy with which they are made (stress? anxiety?) is very different from the love and pleasure you put into your work. I think there is a place for mass-produced and artisan-produced. But after many years of accumulating stuff, I find myself getting rid of everything but the few items that I feel a heart-connection to and those are usually things made slowly by human hands. Those are the things that give me the most joy. Judy, I love that a post about time speaks to you of connection! Marilyn, I love this article because the process of weaving you describe is akin to meditation. I, too, have a great deal of respect for slowness. Living in North America is often difficult for those of us who want/need time to reflect. I’ve always felt out of step, but when I moved to Italy for two years, I found a tribe that accepted and embraced slowness. Nobody was “put out” when stores closed for the afternoon siesta, nor was there any debate about whether or not stores should be open on Sundays. Meals were prepared with care and eaten with appreciation in the company of others. I believe your woven products are much like these meals: made with care for the people with whom they’ll be shared. What a lovely post! I have been weaving on and off for forever and am recently getting back into it in a serious way. When I told my husband that I was going to weave dish towels, he asked “Why?” and I replied “Why not?”. He wasn’t being mean as I weave lots of rag runners and rugs and hook rugs for the floor and quilt quilts for the beds, and he loves everything that I create, but he was surprised that I would make something like that. I have one more towel to go and then I am anxious to wash them and hem them and see how they work out! Of all the fiber art that I do, weaving and rug hooking are the two most work intensive and I really liked your ending : They take the right amount of time! I would love to add a link to this post on my blog after I finish the dish towels. Would that be okay? Engaging in fiber arts isn’t about the time, is it? I have no trouble believing that rug hooking is work intensive, and as a quilter-wannabe, I’m surprised isn’t at the top of your list too. I’d be delighted to have you link to this post. Please also send me a link to your post because I’d love to see the finished towels. I did finally finish the towels and I love them! Not as gorgeous as yours, but a good start. I hope people are reading this post….I added a link. Congratulations on finishing your towels, Debbie. I admire you for making one of them plaid — all those weft color changes! And thank you for sharing a link in your post. I’m glad my answer resonates with you, Lee Ann.